In addition to filling your prescriptions, Duncansville Pharmacy offers many services to keep you healthy and feeling your best. For more information on our services, click below to expand the area you are interested in! All of our Registered Pharmacists are board certified to administer vaccines to adults over the age of 18. 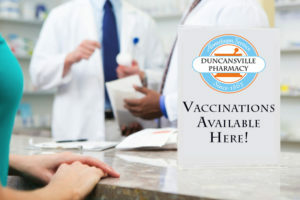 Please click here to view our immunization page for more information. 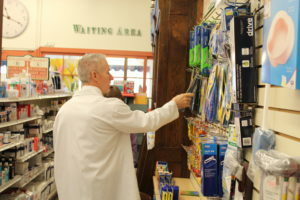 We offer a complete line of OTC products including Old Time Remedies, Vitamins & Supplements of various applications. For your convenience we offer free delivery to the Duncansville and Hollidaysburg areas. Call us today to place your order. Pressed for time? Order your refills online for pickup in store! Click Here to order! 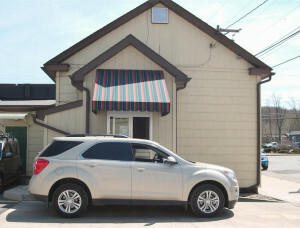 Our Drive Thru window is available for service during all of our business hours for your convenience! This robot (or “The Rhino”) interfaces with the pharmacy computer system to fill, label, and deliver up to 150 prescriptions per hour. The system contains 200 universal dispensing cells, which are easily calibrated by pharmacy staff on-site. It also has three vial dispensers, and three control center options. Because the system fills directly from the dispensing cells, there is no drug cross-contamination. The SP 200 also prints and applies the prescription and auxiliary labels, and delivers uncapped vials for final inspection using on-screen drug image verification. Bar codes are used throughout the process, ensuring every prescription is filled and labeled accurately.